I stayed up until 3am Friday night finishing my block for the Intro to Hand Work class. I decided to do a more complex border around the star. It wasn’t planned, but I like how the turquoise ended up creating a diamond frame around the star. Quilting geometry is endlessly fascinating. 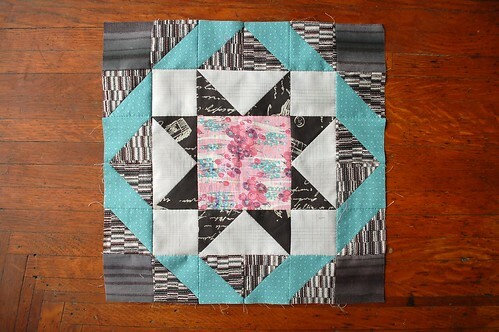 Love the block Karyn – great colour, pattern, and design choices! totally! it looks so good karyn! Very beautiful! And I like the turquoise too. ooh i love the diamond frame. i just looked at the pic full size and saw the amazing hexagon pattern on the fabric. your block is so wicked!